From the Bay of Pigs invasion to the Cuban Missile Crisis, from the Mariel Boatlift to Elian Gonzalez, from diplomatic ties cut off to ties renewed, Cuba has long loomed large in the American imagination. Cuba lies just 103 miles off the Florida Coast and until travel between the two countries became possible again, every year there were news reports of people risking their lives to make that crossing, to land in the US and the Cuban expat and Cuban-American community in Miami is a large, vibrant, and thriving one. But not all Cuban immigrants ended up in Miami; some went much farther afield. 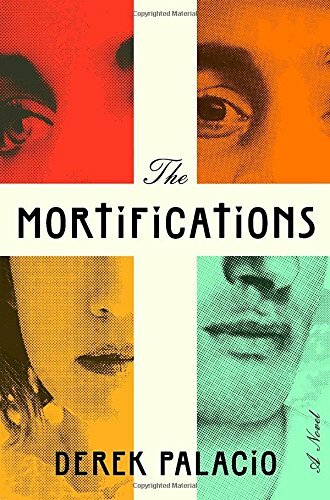 In Derek Palacio's novel The Mortifications, the Encarnacion family, mother Soledad, and twins Isabel and Ulises flee their country in the Mariel Boatlift, leaving behind father and political rebel Uxbal as they work their way north to the city of Hartford, Connecticut. The family settles into life in the US, unable to truly leave behind their memories of Cuba and Uxbal. Each of the characters is haunted by the past even as they grow and change in the present. Soledad meets Willems, a Dutch tobacco farmer, who becomes her lover. Isabel, nicknamed the Death Torch in her community, finds a strange connection to death, helping the dying to the other side, and eventually goes deep into the religion of her father. The bookish Ulises grows to gigantic proportions and almost inhuman strength as he helps Willems nurture tobacco in the unlikely soil of Connecticut. Years into the family's exile, a letter arrives from Uxbal and each of the three Encarnacions is pulled by the Cuban past none of them has ever broken free of. The novel is a complex and philosophical character study and the third person narration moves focus from Soledad to Isabel to Ulises allowing the reader insight into each of these unusual characters. The characters all suffer their own mortifications, sacrifices that mark them indelibly. This is not magical realism but it is certainly in that tradition; it has a Catholic sensibility with a mythical feel to it. Palacio has captured the loneliness and longing of each of the characters, their reaching for a connection, for home, and for family that has never been completely forgotten. Each of them is desperately seeking a happiness that eludes them, their melancholy burrowing deep in their flesh and bones. The writing is well done but somehow the story feels flattened and the reading of it is slow and deliberate. There are no quotation marks around dialogue here, causing speech to run into thought and vice versa. Because of the strange ponderousness of the tale, this is really only suited for big fans of literary fiction.